I just found out that TopAlarmSystem.com is implementing a wonderful program that will allow bloggers to assist in the recovery efforts from the recent severe weather. For every 400+ word blog post written about the disaster or the tornado outbreak of 2011, $25 will be donated to the Christian Service Mission in Birmingham, AL. Now, I can’t relate any first-hand experiences with this week’s tornadoes (or even last year’s) because we live about 160 miles south of B’ham. But we do have a couple of family members that live up there, and I very well remember the shock of hearing the death toll rise from last year’s devastating twister and also of waking up the other day to learn of another one hitting the area not even a year later. Hundreds of people, in Alabama alone, died in just a few days time last year. This tornado wasn’t as deadly, but it did leave behind destruction, injuries, and suffering in it’s path. My hometown was spared from any severe damage, but just a few miles down the road, Enterprise, AL suffered a direct devastating hit from the twister. Most of the damage was concentrated downtown around the local high school, and tragically, students and teachers were present in the school at the time. My first cousin’s wife was a teacher at the high school during this time. The tornado struck just after 1pm, right as the schools were releasing their students early because of the severe weather. Not having a chance to leave yet, they took refuge in the hallways. Students, myself included when I was young, are taught from an early age through drills and exercises that the inner hallways of the school are one of the safer places to be in a tornado. Unfortunately that didn’t prove to be true in this case. Eight students died after a concrete wall collapsed. The tornado was so strong and destructive that it flipped over cars in the parking lot, completely flattened houses and parts of the football stadium, snapped utility poles in two, and uprooted large trees and tossed them around like toothpicks. I remember driving by a cemetery a couple of days after the storm and seeing large headstones and graves that had been completely torn from the ground. The area where the damage was concentrated in Enterprise looked like a major bomb had gone off. Our nearest neighbors are a family that was forced to relocate because of the complete destruction of their home in this tornado. The tornado was estimated to have been 500 yards wide and left a path 10 miles long. In the end, nine lives were lost that day, over a hundred injuries, and a total of $307 million in damages were sustained in Enterprise alone. A moving tribute to Enterprise, AL. When the storm was over, Governor Bob Riley called in 100 National Guard troops to help and placed more on standby, a dawn till dusk curfew was implemented, and President George W. Bush visited on March 3 and declared the whole county a disaster area allowing more aid to be made available for the community. The one good thing that came out of that disaster was the outpouring of support from not only nearby communities, but from all over the world. I can clearly remember the trailers parked on the side of the road that were loaded down with bottled water and other items that had been donated by caring people. I remember being in the Enterprise Walmart with my mother within a month of the March 1st tornado when the sirens went off. All of us shoppers and the employees were quickly herded to the center of the store where it was supposedly safer. We could see through the doors that it was rapidly getting as dark as night outside, heavy rain was beginning to fall, lightning was flashing, and I think we even saw a couple of police cars race down the highway with their sirens on. We were positive that another twister was hitting, and that we were all in one of the worst possible places to be. After many tense minutes, we were finally informed that it was just rotation and an actual tornado had not formed. I read once that although Dixie Alley (comprised of the southeastern U.S.) has fewer tornadoes than Tornado Alley, the ones that we do have tend to be deadlier. Two of the reasons being our hillier and more densely wooded terrain and they’re more likely to occur at night. I’ve been through many hurricanes and floods, but they don’t scare me nearly as much as hearing the tornado sirens go off. With hurricanes, you have days to prepare or leave the area. With the floods that hit our town there was usually enough time to get out, too, because as soon as the river started rising people would keep a close watch on it. But tornadoes can strike in a flash taking everybody by surprise. My prayers are with the people that went through this horrific disaster. 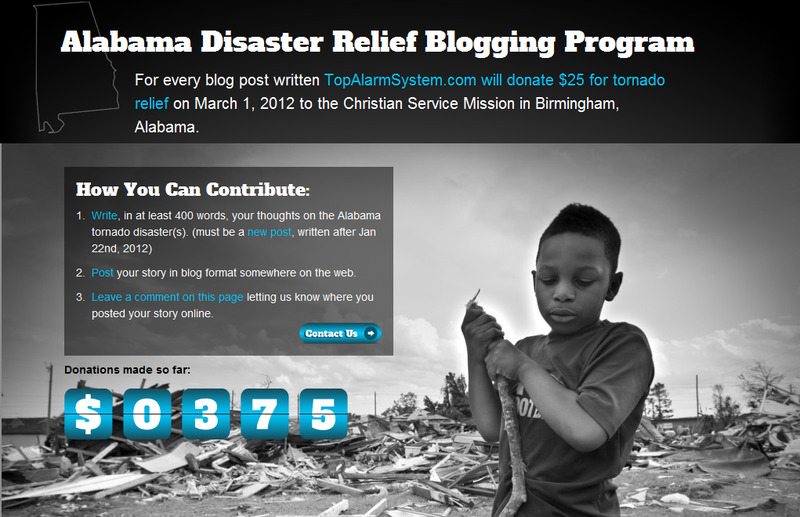 For more information about the Alabama Disaster Relief Blogging Program, you can visit their website by clicking here. Previous post: Is it spring already?